Bushmans Kloof offers a range of luxury Western Cape nature reserve accommodation surrounded by scenic natural surroundings. Bushmans Kloof Wilderness Reserve & Retreat offers a selection of different Western Cape nature reserve accommodation options to choose from. Choose between luxury and deluxe rooms, elegant suites and the exclusive family friendly Koro Lodge. The luxury rooms are fitted with either twin or double beds and boast a private patio overlooking the scenic indigenous gardens. The rooms are elegantly decorated and feature air-conditioning, underfloor heating and easy access to the nearby swimming pool. Each luxury room is also fitted with bathrobes and indulgent private-label toiletries. Double rooms are spacious and feature large private patios and a lounge areas within the bedrooms. This Western Cape nature reserve accommodation features romantic fireplaces, satellite flat screen TV's, DVD players, CD players and iPod docking stations. The rooms are also fitted with air-conditioning and underfloor heating. The spacious suites are fitted with comfortable king size beds, large private patios and designer en-suite bathrooms complete with showers and Victorian baths. The Paterson Suite boasts a separate sitting room and a romantic fireplace. The luxurious suite is decorated in dark wood and leather finishes. The Niven Suite features an airy and light interior and 2 designer en-suite bathrooms. The enclosed courtyard is ideal for private dining. This luxurious suite combines romance, elegance and modern technology. The en-suite bathroom is fitted with indulgent private-label toiletries while the suite features a master suite, a separate living room and a private infinity pool where you can cool off during the warm afternoons. A romantic outdoor shower is ideal for warm evenings while the suite is fitted with all the modern amenities. These include 2 flat screen satellite TV's, a large collection of CD's and DVD's for you to enjoy, an iPod docking station and air-conditioning and underfloor heating. This Western Cape nature reserve accommodation is an existing farm house ideal for families seeking exclusivity and privacy. This Bushmans Kloof lodge features handcrafted South African furnishings, a fully equipped kitchen and bar and flat screen TV's. Additional facilities include DVD players, music, air-conditioning underfloor heating, games and wireless internet access. There are 2 master bedrooms each featuring a private terrace overlooking the beautiful natural surroundings. Each bedroom has its own en-suite bathroom. The living room features a fireplace, ideal for winter evenings while the large terrace offers striking views over the reserve. The loft area comfortably sleeps 4 children and provides them with a private play area. An independent furnished family living space is situated a few metres away and is ideal for adults or 2 teenagers. The interiors feature a flat screen TV, en-suite bathroom, air-conditioning and underfloor heating, games and DVD's. The Bushmans Kloof Wilderness Reserve and Retreat has sixteen rooms and can accommodate thirty two guests. All rooms have en-suite bathrooms with separate bath and shower. 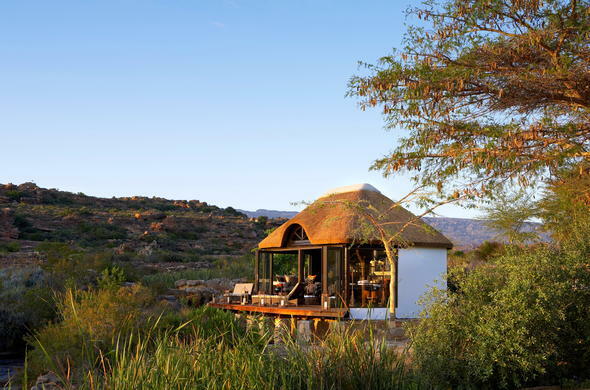 Bushmans Kloof Wilderness Reserve & Retreat boasts luxurious South Africa Nature Reserve accommodation. Each room and suite features a spacious and beautiful en-suite bathroom.